Community engagement requires careful consideration of factors such as who to consult, and the timing of consultation. Resources exist to support and guide engagement. Coastal institutions — state and local government agencies, community groups, small enterprises such as tourism businesses — already have ways to engage with their stakeholders. There are a range of manuals, guides and tools available to help plan consulting and engaging with the community. The goals of engagement need to include building trust with stakeholders through being open and transparent and having a genuine commitment to the relationship. Coastal institutions — state and local government agencies, community groups, ‘small to medium enterprises’ (SMEs) such as tourism businesses — already have pathways for engagement with their stakeholders. For example, local governments already engage with the community over many small and large issues, from individual building development applications to broad scale city planning. For local government, community engagement is often mandated by state legislation, but generally the specific path to engagement is left to a council’s discretion. This allows flexibility to take account of local context (and varying approaches can facilitate learning as different groups try alternative methods) but it also leads to inconsistency across a region which can be confusing. Other organisations are likely to engage with their stakeholders to facilitate strategic planning (e.g. community organisations) or to understand how to prepare their business for change (SMEs such as tourist operators). The aim of community engagement activity is often to seek input and gain knowledge, support or consensus from stakeholders. An overarching goal should also be to build trust between the organisation and stakeholders. Organisations that have a more open and transparent relationship with their stakeholders — through sharing information on potential impacts and taking seriously their stakeholders’ views— are likely to be trusted by their stakeholders, and this is vital in winning support for action. There are a range of approaches, tools and frameworks for community engagement that have been developed by professional associations, state governments and consultancies (for a list of these see Appendix 2 of the Information Manual 9: Community Engagement. The advantage of using any of these readily available frameworks is that they can help an organisation to think through its goals and strategies. Also, some of these frameworks have detailed information on tools and resources, or even events and training, that can help build the capacity and confidence of staff and managers. The International Association of Public Participation (IAP2) framework is commonly used by local governments. The IAP2 spectrum describes five phases representing increasing levels of public impact— inform, consult, involve, collaborate, and empower— and then matches these with typical strategies that can be used for each stage. Information Manual 9: Community Engagement describes the IAP2 spectrum in more detail with an example of its use. The advantage of using this framework is that IAP2 is backed by ample resources and ideas for staff training. Other resources include the guidance produced by several government agencies for local governments. Although these guides were developed for local councils the information is useful for a range of organisations. The tools, and how to use them, are often generic and include detailed guidance on how to plan engagement, choose appropriate techniques and evaluate activities. For example the Victorian Government published a three-volume series called ‘Effective Engagement: building relationships with community and other stakeholders’ (link to http://www.dse.vic.gov.au/effective-engagement/resources/download-effective-engagement). Volume 3 includes detailed information on various tools which also fit the IAP2 spectrum (see Figure 1). Similarly the Local Government Association of Queensland (LGAQ) has produced a guide to communicating coastal hazards, the Coastal Hazard Adaptation Communication Guidelines (2014) (http://lgaq.asn.au/coastal-hazard-communication-and-engagement). A useful feature of the LGAQ guide is that it outlines how key messages might change depending on the timing of communication. 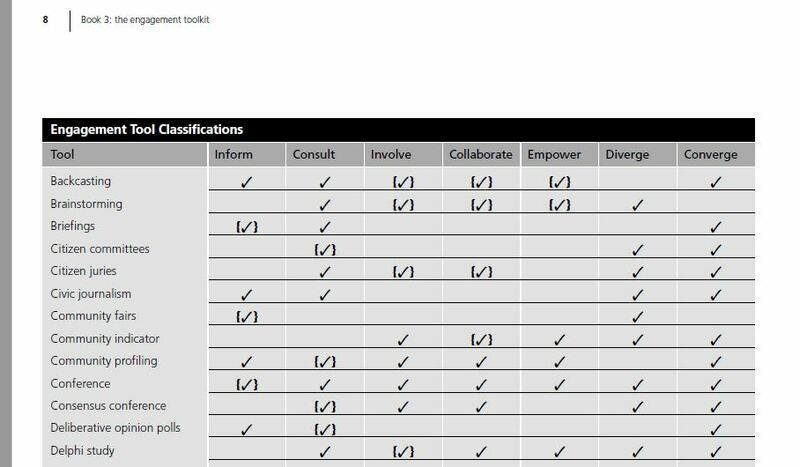 Figure 1: A sample of the classification of tools in Victoria’s Effective Engagement toolkit. Source: © State of Victoria, Department of Sustainability and Environment 2005. The challenges of engaging stakeholders include the following issues. (These are explored in more detail in the Information Manual 9: Community Engagement). This takes careful consideration. While it can be easy to identify those stakeholders that are directly affected, it is also important to consult those who may be less directly affected. Existing community or stakeholder networks can be used to identify stakeholders and arrange consultation. This strategy will help to build a broad base of awareness and is more resource-effective. Don’t overlook consulting within your own organisation – your colleagues have invaluable knowledge and networks and they can also be a useful sounding board for ideas. If you consult too soon, stakeholders may be disengaged. However, if you consult too late, people may have already formed opinions about something they have heard about on the ‘grapevine’, there may be conflict and you may have already lost credibility or the trust of your stakeholders. The rule of thumb is to consult early and often. Existing events that already involve your stakeholders can provide very good opportunities, especially for early engagement activities when you are trying to meet with a broad cross-section of the community. An example of this is the ‘community conversations’ organised by the Mornington Peninsula in Victoria. If you are using the C-CADS decision-making framework then you can factor communication and engagement goals and activities into each of the six steps (see Figure 2). We outline below three key opportunities for engagement that you may consider useful. Early stages of C-CADS - identifying challenges or determining vulnerabilities. (consult, inform) These early stages are an appropriate time to start consultation with existing groups of stakeholders. At this time you would be broadly outlining the climate adaptation challenges and the process your organisation is using to plan for them. With stakeholders, you can devise methods to mine their local knowledge and discuss how they can be (want to be) involved in the process. Ideally it is useful to begin a discussion about how the community sees the important values of the coast – what matters most and what the community may be prepared to trade off. (See how the City of Lake Macquarie undertook this step in the case study Planning to Adapt – the Marks Point and Belmont South Local Adaptation Plan. (involve, consult) At this stage you are working through options in more detail and so it is useful to have more detailed discussions. You may decide to set up a form of reference group that you can involve in the decision-making – which means handing over some of the power to have a say in the decisions. How will you manage this reference group? How much power will it have? How will it negotiate its roles and responsibilities? What is the timeframe for its involvement? (See also the case study of a Citizens Jury (Sydney Adaptation Strategy Deliberations for ideas). Once you have a plan or list of actions, how will you get feedback? Some local governments have found that more ‘diffuse’ meetings such as an ‘open house’ work well, as this allows community members to engage at a time that suits them and in small numbers (thus avoiding the ‘grandstanding’ opportunities of a larger public meeting). CoastAdapt has an online forum, CoastExchange, where this issue has been discussed (see thread on Community Engagement). While you will seek feedback on your ideas, you should also be open to new ideas. How will you handle fresh input or new ideas? Revisit the list of important values. Are these being addressed through the consultation process? Keep a check on how representative your consultation has been. Have you consulted with a broad cross-section? Is your consultation just reinforcing the power status quo or have many groups had the chance to input their views and aspirations? Do you need to provide support to minority or marginalised groups so their input can be considered? The many overlapping interests and polarised views inherent in coastal adaptation will inevitably lead to conflict. How will you handle conflict? Research suggests that the higher the potential for conflict, the more engaged you need to be. (inform, consult) The later stages of C-CADS are a useful time to consult again to discuss the adaptation planning process and outcomes. How have you incorporated the views and values of groups and individuals you have consulted? How do they keep providing feedback? The feedback from this stage could be a way to keep gathering local knowledge that will be important for monitoring and evaluation. Figure 2: How consultation can fit into the C-CADS decision-making framework and the IAP2 framework. Source: © NCCARF 2016. LGAQ (Local Government Association of Queensland), 2014: Communication Guidelines: Coastal Hazard Adaptation. Accessed 17 June 2016. [Available online at http://lgaq.asn.au/coastal-hazard-communication-and-engagement]. Victorian Government DSE (Department of Sustainability and Environment, 2005: Effective Engagement: building relationships with community and other stakeholders. Book 3: The engagement toolkit. Accessed 8 January 2018. [Available online at http://www.peecworks.org/PEEC/PEEC_Inst/01795CC6-001D0211.2/effective%20engagement%20book%203.pdf].